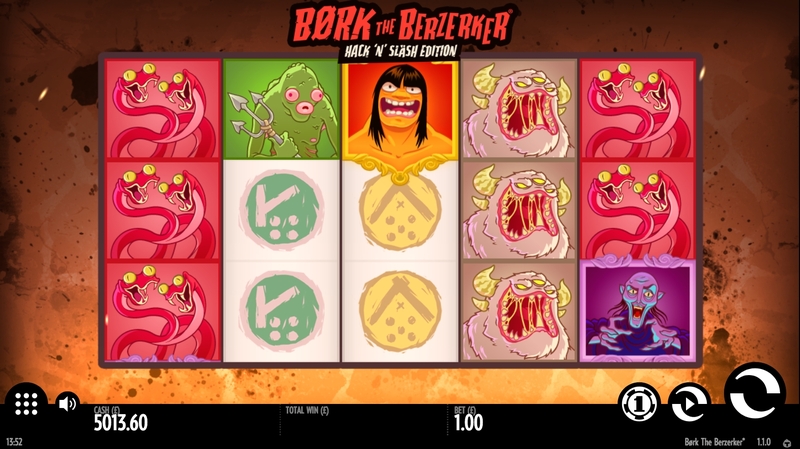 Børk The Berzerker Hack ‘N’ Slash Edition slot is a very unique slot game from Swedish developer Thunderkick. The theme is Norse mythology, with the main character being the monster-slaying hero Børk The Berzerker. Some may remember him from Børk The Berzerker slot, which is strangely no longer available at this time. It goes without saying that careful precision and skill has been used by the developers at Thunderkick to make this visually and audibly very appealing. However, what we want to know is whether Børk intends to Hack ’n’ Slash his way through our bankroll. The only standard thing about Børk The Berzerker Hack ‘N’ Slash Edition slot is the 5 reels over 3 rows with 20 fixed paylines. Beyond that, the game has a quite different look and feel to what we are used to with online video slots. The symbols are a variety of monsters, scorers, 2-headed snakes, maidens and our warrior hero Børk. There are no card symbols, instead you have some special icons which are in a coloured circle. Top paying of all the symbols is the Maiden, rewarding 50x for 5-of-a-kind (5OAK). They drop down in value through the symbols with the pale blue icon being the lowest, paying 3x your bet. Expect some decent pays for even 3-of-a-kind as many of the symbols are stacked across the reels. During the base game, should Børk appear on the middle reel, then he will expand to cover the whole reel. This can potentially create some good winning opportunities, but more often than not it doesn't deliver much. Land 3, 4 or 5 of the purple scatter symbol and you will get yourself 10, 15 or 20 free spins respectively. During the feature Børk will expand on reels 2, 3 and 4 should he appear. The game gets really interesting if you get multiple Børk Wilds on these reels, however this is also a rarity. Note that the feature cannot retrigger, as all the scatters are removed during free spins. 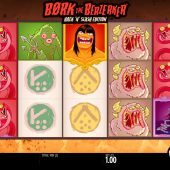 Børk The Berzerker Hack ‘N’ Slash Edition joins an exclusive club of high volatility slots from Thunderkick, such as The Falcon Huntress and Pink Elephants. All of these games are very entertaining in the own right, although you can easily burn through your bankroll chasing down the features. What is really interesting is Børk The Berzerker Hack ‘N’ Slash Edition slot has at 97.3% RTP, which is incredibly rare. IF you like this kind of theme then it is always worth checking out Yggdrasil's Viking's Go Berzerk for more axe-wielding warriors.